"I'm a descendant of three lynching victims," one visitor said. "I wanted to come and honor them." The Legacy Museum: From Enslavement to Mass Incarceration opened this week on the site of a former slave pen in Montgomery, Alabama, where black people were once imprisoned before being sold at auction. An unflinching reminder of America's racist legacy, the 11,000-square-foot facility will serve as a place of learning for visitors by detailing the tragic history of the slave trade and following through to current-day problems associated with mass incarceration. The Equal Justice Initiative, a Montgomery nonprofit that provides legal aid to people who may be wrongly convicted, said it raised more than $20 million in private donations to fund the project. 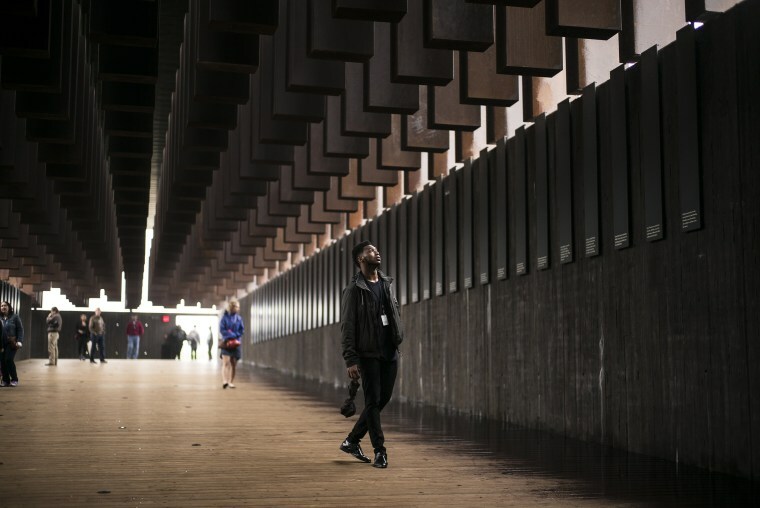 A National Memorial for Peace and Justice is located a few blocks from the museum, and features more than 800 steel monuments that bear the names of lynching victims throughout the country. In its creation, organizers discovered the names of 4,400 black people who were lynched or died in racial killings between 1877 and 1950. For some visitors to the museum and memorial, seeing the stark and plaintive tributes to the past was painful. "I'm a descendant of three lynching victims," Toni Battle, who drove from San Francisco for Thursday's opening in the rain, told The Associated Press. "I wanted to come and honor them and also those in my family that couldn't be here."